The M Den is back! Okay, so the M Den never really left, but it's back in terms of being the official supplier of M gear and apparel. After a season of trying to go it alone, the athletic department decided it was just not worth the effort to try and hock their own gear, so they inked a multi-year deal to once again name the Ann Arbor based merchandiser their official retail partner starting in July. "The M Den has shown incredible loyalty to the Michigan fan base and local community with incomparable customer service, and with the variety and quality of their products," said U-M athletic director Dave Brandon. "I am confident our fans will continue to show that same loyalty to our new official retail partner." "We are proud to have been able to serve the university family throughout our history and we are so pleased and excited to be named the official merchandise retailer so that we can continue to expand upon that history," said M Den owner Dave Hirth. "The cornerstone of our business is offering the finest customer service possible to every University of Michigan fan," Hirth continued. 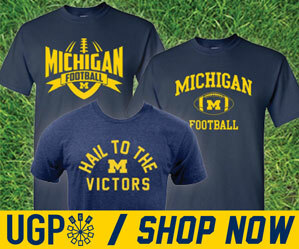 "We have always worked very hard to bring Michigan fans the widest selection and the best quality products available. Now we can do that in more ways than ever given our new partnership with the athletic department, and this is just the beginning." Congrats to the M Den! This is a nice step in the right direction for the athletic department. In theory, the department's idea to sell their own gear and undercut other retailers was a nice one, but the lack of actual retail stores and no real name-recognition, the department's online store really never got off the ground. Not to speak to soon or anything, especially since he's only been on the job for 3 months. But so far, everything Dave Brandon has done, I've been totally impressed with. This decision is no different.